I love roses - receiving, giving and growing them! The reality is that they die, sigh. With an upcoming 50th Wedding Anniversary for dear friends of ours, I wanted to give them the gift of everlasting roses! 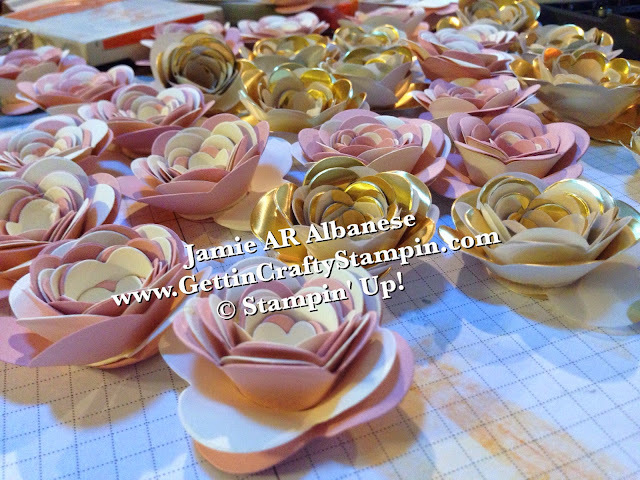 Using the Spiral Flower Die, Big Shot and these stunning collections of paper creating 50 everlasting roses was a labor of love that was fun to do! 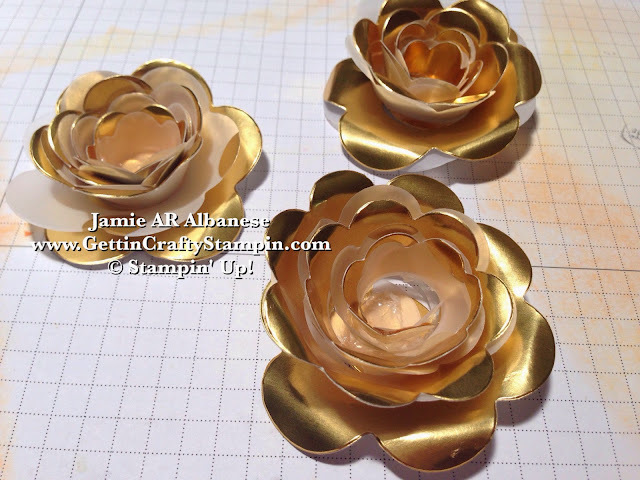 Our dear friends are having their 50th Wedding Anniversary so of course we need these pretty Gold roses. 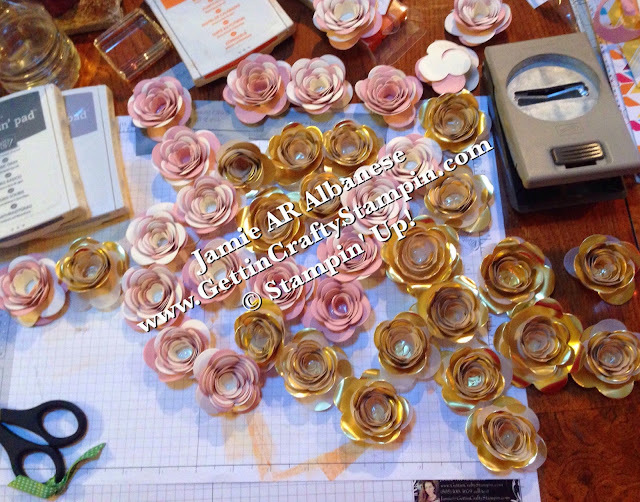 They are decorating with blush tipped cream roses - so incorporating this look is easy. 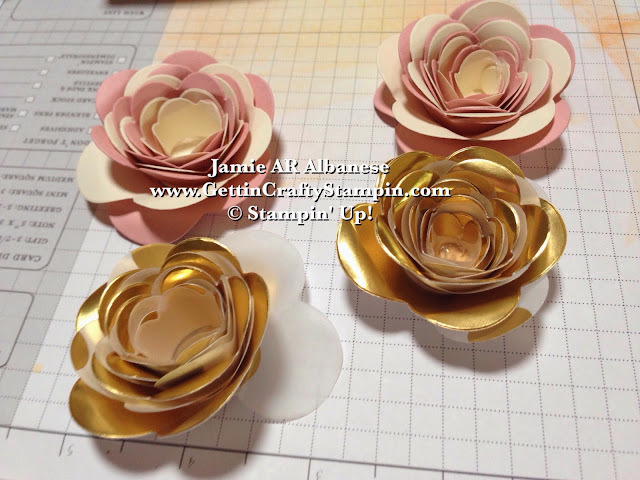 Use the Very Vanilla and Blushing Bride card stock and do the same as the gold flowers. Roll the edges with the bone folder, roll and use the hot glue to adhere it. This is a great way to add interest and make for a pretty table decoration! WHEW! So we worked for hours, my helpers Stephany, Marta and I.. but this labor of love is one that will bless our beloved friends (who I am often mistake as her daughter and love her deeply). All lined up and ready to party! So add a strip with the names and date and these pretty decorations become a great gift to the guests!! Simply adhere it to the bottom of the rose and it can be a memorable 'leaf' of sorts. In person, these roses are breathtaking! They are everlasting, perfect roses that will blossom and add beauty to the festivities (they are re-saying their vows). Being a part of this special day means so much to me! I love that these are a fun decoration that will bless our dear friends. Celebrating a remarkable occurrence, especially in this day and age, is a wonderful way to enjoy life. These roses will live on and delight for years to come... and isn't that just the coolest thing?? 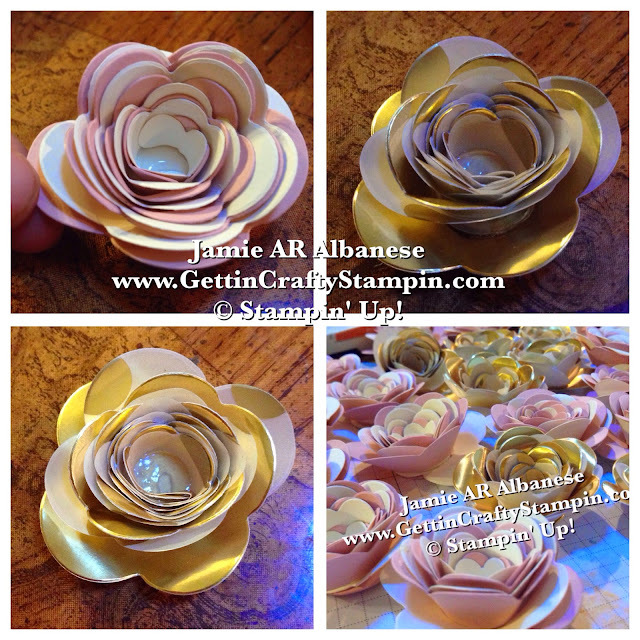 Did YOU enjoy these fun 3D 50 roses? It's amazing what a few pieces of paper, this Spiral Flower Die, Big Shot and some love can create!